Greener Way to Travel ~ When traveling, it is important to be responsible and to be mindful not only of your own happiness, but of what is good for the environment as well. With this, it will be good if you can practice green travel, which can be best done through following the things that will be mentioned in the rest of this post. There are many luxury resorts that you can book for your holiday in the Maldives, but Finolhu Villas is indeed one of the best, especially if you are looking for an eco-friendly holiday. It is fully solar powered, which is the first of its kind in Maldives. It has more than 2,000 square meters of solar roof, providing the energy requirements of the entire resort. It is also known for its efficient waste management and self-sufficient water supply, which is one of the ways to help minimize erosion in the beaches. Italy is definitely one country on the bucket list of many people. Instead, consider an authentic Italian farmhouse as an alternative choice for accommodation. It is not only eco-friendly, but you are also helping farmers make a living out of what they have. You are helping local economy instead of supporting global hotel chains. If Austria is next on your holiday list, do not stay just anywhere. Hotels will surely provide you with a memorable stay. This is a great place not only for kids, but also for adults to unleash the child within them. It is a good place to have a sustainable holiday without splashing out. It is a good place for children to learn about nature and caring for the environment. Hotels share the green habit by which Austria is popular for. A holiday to Croatia is renowned for many things, its beautiful scenery being one of the main ones. This national park has some of the most stunning landscape in the country, which is surely one of the most breathtaking that you will ever see. Its changing colors give it a distinct appeal compared to other lakes. It is also a UNESCO World heritage Site, which gives it more appeal for tourists. It is a protected area, so you can expect that it is well-conserved in order to preserve its beauty. Even with the influx of tourism, it is still being protected. This is an ideal destination for those who love the sun, sea, and sand. Aside from the beauty of its beaches, vacationing in Samoa is also a good idea because you are supporting ethical human and environmental practices. It has launched a $1 million project to improve island biodiversity, which has been praised even by the United Nations. The government and private organisations have expressed their commitment to achieve disaster resilience and environmental sustainability. It has been proactive in its approaches to combat climate change and other environmental problems. Traveling often lets you take a load off your feet, and this prospect sounds relaxing to many people. Many people choose to fly on planes, expecting a vacation to restore their health. However, plane travel can often have the reverse effect. When it comes to choosing a plane ride over traveling by van, the latter is generally safer for your health. At the same time, there are other considerations to be made before you officially hit the road in your conversion van. During a plane ride, you are instructed to sit and relax. The problem is that all the sitting can actually be bad for spine; especially you have any preexisting back problems. While experts recommend walking as often as you can to prevent plane ride-induced back pain, the trouble is this is unrealistic, considering the confined spaces of a plane. You are better off driving because you can stop and stretch as often as you need to. Plus, conversion vans offer more reclining space. The reclining capabilities of conversion van seats are also helpful for your legs. You don’t have to be tall to suffer from the small spaces on a plane. Give yourself more leg room during your travels and get to your destination by van instead. Airplanes consist of cram spaces that hold 200 or more people at a time. Getting sick from your flight is a great possibility, which can ultimately ruin your vacation. While you couldn’t imagine someone flying when they’re sick, it happens all the time. The only way you can truly get away from the germs is to not fly at all. Before you give up on vacationing altogether, consider the benefits of traveling by road first. While road trips are the way to go, you can’t just squeeze your family into any old car. This is especially the case if you are going on an extended trip to another part of the state, or to an entirely different part of the country. Conversion vans are the best way to travel because they offer many of the comforts of home. You certainly can’t recline into a sleeping position and stand freely about an airplane whenever you wish! Natural areas, such as forests, waterfalls, visiting Uganda Gorillas and jungles, are some of the most popular destinations for travelers around the world. While these locations are beautiful and majestic, they’re also some of the most fragile, and can be quickly damaged by careless human impact. Travelers who wish to visit these locations in a sustainable manner often engage in ecotourism, a type of tourism that involves visiting a location using low-impact, alternative methods. Simply choosing any program or third-party without understanding the motives behind the organization may lead to more harm than good. In general, you’ll want to choose a destination that are protected or deemed as World Heritage sites, as this will increase the chances that your trip involves sustainability. In addition, keep in mind the type of vacations you’ll need to search for in order to engage in ecotourism. While searching for Orlando Vacation Package News will yield a wealth of results, they’ll probably be much different than what ecotourists are expecting. While travelling, individuals may be used to bringing along all the comforts of home. However, sustainable travelling will require different packing than that of the average traveler. Focusing on minimalism, sustainable travelers need to scrutinize every single item and determine which they absolutely need or not. For example, anything requiring a plug may be considered unnecessary, and clothes are kept to an absolute minimum. The mentality behind packing light is to reduce your carbon footprint and leaving as small an impact on the destination as possible. If you’re shopping for a small memento from your trip, another tip to keep in mind is the type of souvenirs you’re looking for. Perform as much research as you can to ensure that your souvenirs are not made from endangered animals or plants, or at the expense of these species. In addition, avoid buying seeds or plants from the native region, as this may risk the ecology of your home environment when you return from your trip. While hiking through a natural area, there are several tips in mind to leave a low impact on the environment. Littering is an avoid no-no, along with disturbing the plant life and traveling far off the path. In addition, keep foreign sounds and smells to a minimum, lest you wish to disturb the local wildlife. In general, make sure that you follow the direction of a reputable guide, and tread lightly through the fragile environment. In order to make sure that your trip is as sustainable as possible, you’ll need to understand the basics of ecotourism and how to reduce your footprint as much as possible. For example, understanding what food is in season will help you make better decision while eating out. Another example is to know which accommodations is eco-friendly, and which are not. Before choosing a hotel, ask the representative on the details of their environmental policy, and whether they engage in green practices. Keeping yourself informed will allow you to ensure that your vacation is as eco-friendly as possible. Eco-ski destinations and resorts provide a greener alternative for skiing and other recreational and sports enthusiasts. Private hotels and lodges are now incorporating green and environmentally friendly initiatives in their building and design practices and day-to-day operations as a way of contributing to the preservation of their local environment. Listed below are just some of the best eco-friendly global destinations for skiing and other recreational activities. You can get great late ski deals online so grab a bargain and see you on the slopes. Nestled high in the Canadian Rockies is the Nipika Mountain Resort, a self-sufficient and sustainable accommodation property. Its proximity to the Canadian Rockies makes it an ideal lodging option for skiing enthusiasts. Nipika Mountain Resort is completely off-grid, all cabins and rooms are powered by natural solar and wind sources. Cabin building materials and furniture in Nipika are made from dead wood procured from the surrounding forests. Located near the Jackson Hole Mountain Ski Resort and the Grand Teton National Park, Hotel Terra Jackson is a LEED certified hotel that integrates eco-friendly components in its architecture, design, operations, and energy utilization practices. Energy for the hotel is produced from green sources like solar, wind, and hydropower. Even the toiletries, beds and bedding ensembles are made from organic and natural materials. Recycling is highly encouraged and practiced in the hotel main rooms and guest rooms. Aravis Lodge is one of the best eco-ski accommodation properties in St. Jean De Sixt near the La Clusaz ski commune in the French Alps. Aravis Lodge is situated in a century-old chalet with 17 bedrooms and comfortable guest amenities like sauna and massage facilities. The hotel incorporates an impressive array of eco-friendly practices including utilization of solar energy to produce heat and hot water. Even the in-house restaurant incorporates sustainable practices and uses free range local produce and free trade products in their menu. Going green isn’t restricted to the house and office, by far. Choosing eco-minded destinations such as these Ski Resort options or Eco-Spa Resorts can make your green efforts even more enjoyable! Many people are striving to practice eco-friendliness within their home, working lives, and when traveling. This results in a positive step in the bid to reduce carbon emissions. However, one of the largest contributors of carbon emissions haven’t quite been tackled – transport. Essential commutes, like the commute to and from work, are significantly affecting climate change. Traffic congestion means journey times are longer than usual in rush hour, resulting in more fuel consumption and consequently more carbon emissions. Using alternative, green ways to travel can greatly reduce carbon emissions, travel expenses and even commute times. If you live within a reasonable distance, you have the ability to leave your car at home and save on fuel. Walking or cycling to work can be enjoyable in the summertime and great exercise, particularly for office workers who are generally seated for the duration of the day. Although you may not want to leave your car at home every day, if the weather looks sunny and you have a burst of energy why not choose to walk? With fuel prices constantly rocketing, choosing to walk or cycle can be incredibly attractive due to the money saving aspects. This is a fun way to spend a vacation as well. When you walk or cycle, you will experience a better sense of the culture and town you are visiting. If you live a greater distance, walking or cycling may not be a practical option of getting to work and around town. Rather than jumping straight behind the wheel, ask colleagues in the office to see if anyone lives nearby and ask if they want to start car sharing. If you and a coworker share a car to work you could half your fuel costs, mileage and carbon emissions. Alternating days of who drives can also reduce the stresses of driving each morning. Consider doing this with nearby friends and neighbors who frequent the same stores and go together. If no one from the office lives within your area you could consider public transport as an option. Initially this may sound unattractive, but often urban areas have convenient transport links. Considering monthly passes can also save you some money on public transport, in some cases it may actually be cheaper than the costs of running a car and far less stressful. Using public transportation minimizes the number of cars on the roads, reducing congestion and carbon emissions. It is often more convenient when traveling, especially internationally, to use public transportation. Hybrid cars are becoming increasingly popular due to their financial and environmental benefits. They combine clean electrical energy with a gas powered engine, making them a cleaner and more fuel efficient method of transport. Their fuel consumption is lower than that of an average car, saving you money on fuel. Before you buy a car or even rent one, consider getting a hybrid car. Depending on where you live — in a big city or near a bus or train line — it may behoove you to not own a car at all. And when you travel, it may not be in your best interest to rent a car if you won’t need it every day. In these instances, it may be convenient and economical to use an alternative to a taxi service. Using this service as needed, you will save money by not owning or renting a car and not having to pay for insurance. It will also save you the stress and hassle of driving, especially in new areas. Although working from home isn’t always possible, if you live quite a distance from your work you could find out if working from home a few days a week or month would be acceptable. This could save you significant amounts of money and drastically reduce your carbon emissions. There are many advantages to making eco-friendly choices, especially regarding transportation. Working to reduce carbon emissions will impact global warming, and it’s also proven that green ways to travel are often the most cost effective. Consider a green alternative to transportation when you can. Washington, DC and Arlington County, VA recently launched a bike sharing program, Capital Bikeshare. This program makes 1,100+ bikes available at 110 stations. With 11,000 members, it is already the largest in the nation. These programs have been successful in Europe. They are sprouting up throughout the US as cities look to provide greener, cheaper, healthier transportation choices. There are many advantages to bike sharing. They save on parking spots, and they increase transportation choices. Additionally, they save money in the community. One particular aspect of bike sharing is illustrative of why it is successful and how it can point the way toward a greener future: parking. Car parking, in particular “free” car parking. It has recently come under scrutiny from urban planners as one of the primary drivers of traffic, auto-oriented development, pollution, the degradation of the urban fabric, and the high cost of housing, among other sustainability challenges. Providing bike share parking eliminates these challenges. As this paper shows, the cost of a car parking space is around $16,000 while the cost of a bike parking space is $78. Also, as part of Arlington County’s Master Transportation Plan, efficiently using curb space (a limited public resource) is one tool in providing transportation choices. Even with the new bike share stations in Arlington County, which replace some car parking spots, nearly all of the public curb space is still devoted to cars. In these economic times, with cities needing to save money and maximize the efficiency of limited public resources, bike share parking seems to be the obvious choice. Bike sharing also contributes to the vitality of communities. It enables people to enjoy neighborhood and commercial centers by more people, not automobiles. In creating places where people want to live, work and play, people beget more people, business begets more business. Bike sharing is one tool to creating a vibrant, sustainable place. Cities across the country are building protected bike lanes. They find that they promote exercise and economic development while offering a clean alternative mode of transportation. While road bikers and bicycle messengers often prefer “open” bike lanes that flow next to vehicular traffic, they come with several downsides. Cyclists frequently encounter road debris. This can include nails and broken glass, roadkill, jarring drain hole covers and bad parallel parking. They must constantly beware of car doors swinging into their paths. These obstacles are an acceptable trade-off for cyclists willing to give up a little safety for speed, but this sentiment is not shared by everyone. Studies show the wider community prefers protected bike lanes. These lanes feature a physical barrier (such as a curb or plastic post) between cars and cyclists, due to safety concerns. A recent study, published in the American Journal of Public Health, found that compared to roads without any biking infrastructure, the risk of injury for riders on protected lanes dropped by 90 percent while roadside bike lanes saw a drop of just 50 percent. Since people use safer bike lanes more often (all things equal), it could be argued that they would be a greater source of public health. A 2008 study in the Journal of Physical Activity and Health found a strong inverse relationship between the occurrence of obesity and active transportation. In addition to safety and health benefits, studies cited in a USA Today article support the notion that protected bike lanes benefit business communities. The New York City Department of Transportation found that after installing protected lanes in 2007, nearby small businesses experienced much higher sales growth than the borough average. Portland State University compared the spending habits of drivers and cyclists. They found that while drivers spent more per visit, cyclists shopped more frequently and spent more overall. After Google-Motorola Mobility moved its headquarters to Kinzie St., Chicago Mayor Rahm Emanuel argued that streets with bike lanes also have the potential to attract businesses. Protected bike lanes are safest. However, all bike lanes can provide immense environmental benefit when less cars are on the road. In the case of the bike sharing program, Denver B-cycle, the group estimated 43% of the trips completed with its bikes mitigated car trips. The organization estimates this prevented 312,121 lbs of carbon dioxide and nearly 10,000 lbs of toxic air pollutants from being released. They also saved over $41,000 and $311,000 in gas and parking expenses. A PubMed study based in Barcelona estimated that bike trips prevented nearly 20,000 lbs of carbon dioxide. Between 1874 – 2011, they built only 62 protected bike lanes. However, they constructed 40 additional lanes by the end of 2012 and planned for 100 more in 2013. Though frequently the target of obnoxious and uninformed rants and raves, research shows that bike lanes benefit communities as a whole—whether they know it or not. Sometimes, the greatest way to make an environmental impact is through individual action. Bike to Work Day is an annual, national day of local action. Individual bikers make the decision to ride their bike to work. As they meet up with other bikers, their numbers grow to visually demonstrate a growing popular movement. In Washington, DC, the government is responding with programs to accommodate and encourage more bicyclists. What is it about Minneapolis? A frozen tundra in winter, the Minnesota city has already built a reputation as a bike friendly city. Walkscore has found success evaluating which are the best areas in terms of getting around on foot. They recently turned their attention to rating the ease of 2-wheel locomotion as well. The site now has a Bike Score and has bestowed the #1 ranking for bikeability Minneapolis. The scores are from 0-100. They rate the bike infrastructure, including dedicated lanes and trails. They also determine the hilliness and destinations and road connectivity. The number of bike commuters count as well. They haven’t implemented Bike Score everywhere. They are expanding, so if your city isn’t currently listed, let them know you want to be included. Perhaps in a fitting show of how our cities and neighborhoods are not designed to biking, number one ranked Minneapolis doesn’t even get a B for its effort. Aside from the massive inputs of fuel, cars are not a “sustainable” transportation source. They rely almost entirely on non-renewable materials like metals and plastics. Bikes, while powered by humans, also suffer from this issue. They use aluminum, titanium, lubricants, and petroleum-based synthetic rubber. The bike has the possibility to touch all three legs of sustainability. On the economic front, they will sell the bikes for $20, with materials that cost $9. Access to mobility can potentially help raise millions out of poverty and provide access to food, water, and work. Furthermore, the bike will be able to be recycled. Nimrod Elmish, Gafni’s business partner, claims the bikes will be maintenance-free. Instead of a bike chain, they are using car timing belts. Even more, the tires will last for 10 years; you won’t have to inflate them either. NPR reports that “Gafni, believes the bike could be a boon to the world’s most traffic-congested cities and help people in remote parts of the Third World get from place to place. With a focus on convenience and safety, bike sharing and bike lanes enable people to make environmentally friendly commutes. If there’s one thing most bike advocates will agree on, it’s that for a city to be bike friendly, it has to have the infrastructure to support biking. Bike infrastructure—like protected bike lanes, good signage, and bike-only traffic signals—is highly visible. It’s tangible evidence of a bike-friendly community. But wouldn’t it also be nice if a city supported biking by supplying bikers with some of the basic amenities that make biking feasible? What about something as simple as air? Colleges and universities throughout the country have started to install bike “Fixit” stands. These standalone bicycle maintenance stations, manufactured by Minneapolis-based Dero Co., come complete with tools like pliers, wrenches and screwdrivers, as well as an air pump. The stands contain just about everything a biker needs to perform basic bicycle maintenance, from tightening brakes, to fixing a flat, to the most basic of bike functions—keeping tires full of air. The stands are available at all times, and some Fixit stands even have accompanying bike vending machines that sell tubes, lube and other basic bike supplies. While colleges and universities have installed the stands en mass—UC Davis has 14 on its campus, Texas A & M 8, Portland, University of Oregon 5—most cities have not. Dero has, in fact, shipped over 2000 of the Fixit stands to college and university campuses, but only about 500 to municipalities. Stephanie, from Dero, told me that they intended to first reach out to colleges, noting that the stands do take some maintenance and that there can be fewer bureaucratic hurdles on a college campus as opposed to a city. Plus, many colleges have dedicated “green funds” to support such endeavors. Cambridge is one of the few cities to have installed the stands. Cara Seiderman, Transportation Program Manager at Cambridge’s Community Development Department, acknowledged that while the stands were not overly expensive and actually easy to install, they do take some maintenance. She assumed this is why cities are wary to install the product. Still, Stephanie, from Dero, hopes that cities will start to install more of the Fixit stands in a move to create a fuller infrastructure that supports biking. Alison Dewey, from the League of American Bicyclists, weighed in on why cities are lagging behind colleges when it comes to installing bike amenities, suggesting that, “Citizens assume that their city officials understand what they want and need. She cites amount of space available, cost, the opinion of nearby businesses and other interest groups as potential barriers to the installation of Fixit stands or bike racks in general. This doesn’t mean that bike amenities are not possible; it just means that bikers need to start seeing them as a possibility—and adding them to the list of what makes a community bike friendly. Air is a fundamental part of biking. Car drivers know this and, in California, for example, if you buy gas at a gas station, the station is required by law to give you air, for free. Keeping your bike functioning is also a fundamental part of biking. And the opportunity for bikers to take ownership over their two-wheeled lifelines—something very few of us can say about a car—is key to the continued success and growth of biking as a primary means of transportation. I’m excited for the day when cities are full of bike lanes and bike boulevards; when there are bike racks on all buses; when bike parking is available at every business; and, especially, for when city streets are dotted with Fixit stands and public air pumps. In the meantime, I’ll just plan on riding in the vicinity of a college campus. I was recently on vacation in Breckenridge, CO. I noticed that biking as a recreation was very popular. There are many roads, passes, and trails to bike on. There are many places to rent bikes as well. The thing that got me was that it was all for recreation. To me biking is a form of transportation. I just don’t understand why you want to spend hours biking for pure exercise when you could use it as a mode of transportation around town, to and from work and running errands. But I know I am outside of the norm in this thinking. Also while in Breckenridge I noticed that there is a very nice paved bike path (that is mostly flat) between the town of Breckenridge and Frisco. These two towns are fairly close together, about nine miles apart. I thought the idea of having a bike path to connect nearby cities was a great idea, and one that should be used more often. With paved paths connecting towns, maybe people would use bikes over other modes of transportation. It seems that sometimes biking is hard to do with safety concerns and not many designated biking paths. In Denver there are many bike paths and routes but when I lived in Manhattan, KS there was one. Yes you could still bike around town easily but there was only one road that had a designated bike path. Like many areas of sustainability, pushing past what is normal or what you are familiar with is the hardest part. That is where we still stand on using a bike versus a car as a society. It seems to me that biking as transportation is used but it is still looked upon more in a recreational light and this is what should change. We should start thinking how to ride our bikes more often instead of using our cars because that to me is how we start developing a sustainable society. The Maldives are as exotic an island destination as any traveler could wish for. With more than 1,100 islands scattered across 500 miles of azure Indian Ocean waters, this is the perfect place to escape hectic everyday life. 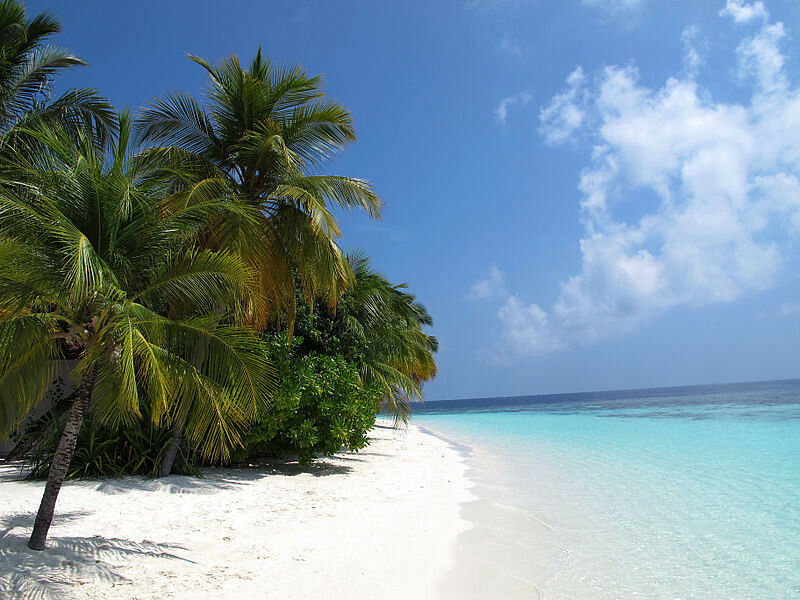 Despite the number of coral islands that make up the country, Maldives boasts only 115 square miles of land. Even though space is at a premium, the country manages to squeeze more than 100,000 people on the capital island of Male. However, Male only measures about two square miles, making it difficult to believe that 100,000 people could squeeze into such a tiny space. The fact is that the people do manage to make Male work, and to accommodate the demands of tourism. The hidden side of all that natural beauty and a capital city that seems to operate without a hitch, is the lengths to which the people must go for trash disposal. With every available space on Male occupied, there’s nowhere left to dump garbage. The other islands in the chain are tiny and generally reserved for feeding the tourism industry. So what is a nation known for its pristine natural beauty supposed to do with its waste? It was a question that plagued Maldives for decades. 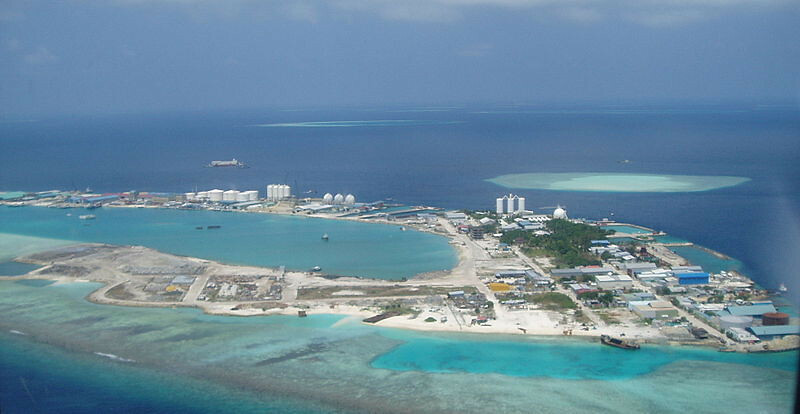 In the 1990s, the government decided to reclaim the Thilafalhu lagoon with the purpose of using it as a landfill. Enormous pits were dug, and the country’s waste began arriving by the boatload. Initially, the sand that was dug out to form the pits was re-purposed as a covering for the garbage. All waste, regardless of its contents, was dumped together in the pits, with little thought paid to how the various ingredients might mix together to form a toxic soup. Today, most of the waste taken to Thilafushi is burned. 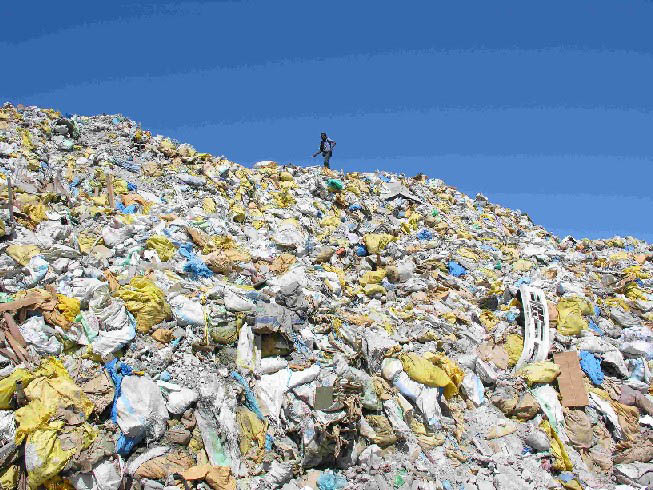 Employees at the site work 12 hour shifts seven days a week in an attempt to keep up with the constant flow of garbage. Only a small percentage of the recyclable items are set aside for recycling, with these items being sent to India. Environmentalists have long been in an uproar over the practice, particularly because the trash is permitted to accumulate in the ocean where it can easily contaminate the food chain for people and animals. While it might be easy to blame the locals for the trash problem, statistics suggest that tourists actually carry the brunt of the responsibility. Government numbers show that the average citizen in Male creates about 2.8 kilograms of waste every day, but visitors generate about 7.2 kilograms each in a single day. To top it off, with almost one million tourists flocking to the islands annually, non-locals outnumber citizens by about three to one. Traveling green is important everywhere, but it is especially so in places with delicate environments and waste problems such as those in Maldives. Until Maldives addresses its garbage island, it seems wise to vacation elsewhere or to make a point of using stringent green practices while there. With increasing oil prices and mounting environmental concerns, the aircraft industry is investing more and more time and money into researching alternative aviation fuels. Here are just a few examples of more eco-friendly alternatives to hydrocarbon based propulsion so we can travel greener. In spring 2011, a research team at NASA’s Dryden Flight Research Center in California tested a renewable biofuel which was made from rendered animal fat. The results were positive with the fuel, made from chicken and beef tallow, producing 90% less black carbon emissions when idling and up to 60% percent less on takeoff. The animal fat biofuel also produced significantly lower sulphate, organic aerosol and other hazardous emissions which are associated with standard jet fuel. Many people are backing pond scum, or Algae as it is more commonly referred to, as the next big thing. These tiny biological organisms transform carbon dioxide and sunlight into energy using photosynthesis. So efficient are these micro marvels they can actually double their weight several times a day and, as part of the photosynthesis process, produce oil which can be used to make fuel. In theory, Algae growth could actually be improved when fed extra carbon dioxide or even sewage, thus helping to clean up other problems whilst growing. Trials have been carried out using algae aviation biofuel by Air New Zealand, Virgin Airlines and the U.S. military. Banned in Australia due to it’s evasiveness and toxicity this strange ‘weed’ could be set to offer a serious alternative to aviation fuel with both Air New Zealand and Continental Airlines completing successful trials using the fuel in recent years. Resistant to both drought and pests, and producing up to 40% oil from each seed, Jatropha has the potential to produce as much as 1,600 gallons of diesel fuel each year from just a single acre. NASA is just one of many research groups who have being testing synthetic fuels as an alternative to aviation fuel. The synthetic petroleum is produced using the Fischer- Tropsch process which is a chemical reaction where a mixture of carbon monoxide and hydrogen is converted into liquid hydrocarbons. Whilst still in testing, early trials have been promising with synthetic fuels producing fewer harmful emissions than regular aviation fuel. It is hoped that these non-petroleum alternatives could help to satisfy the growing demand for less expensive, more eco-friendly fuel. The other major benefit is that, unlike bio-fuels, synthetic fuel can easily be use to power today’s aircraft’s, with little or no modification required. Hydrogen is another possible alternative to traditional hydrocarbon based propulsion. One of the biggest advantages of using hydrogen is that jet engines would require relatively little modification. The difficult part is storing the fuel as liquid hydrogen needs to be stored at -424 degrees and, although lighter, it takes up much more space than regular fuel, meaning airplanes would need to be redesigned in order to store it. Ecologically speaking hydrogen is a great fuel, as the only bi-product of burning it, is water. However this could also be its down fall as many worry that planes powered by hydrogen could end up becoming unpredictable cloud-making machines.